I can't help a good old online window shop of the things I can't (or won't let myself) afford. 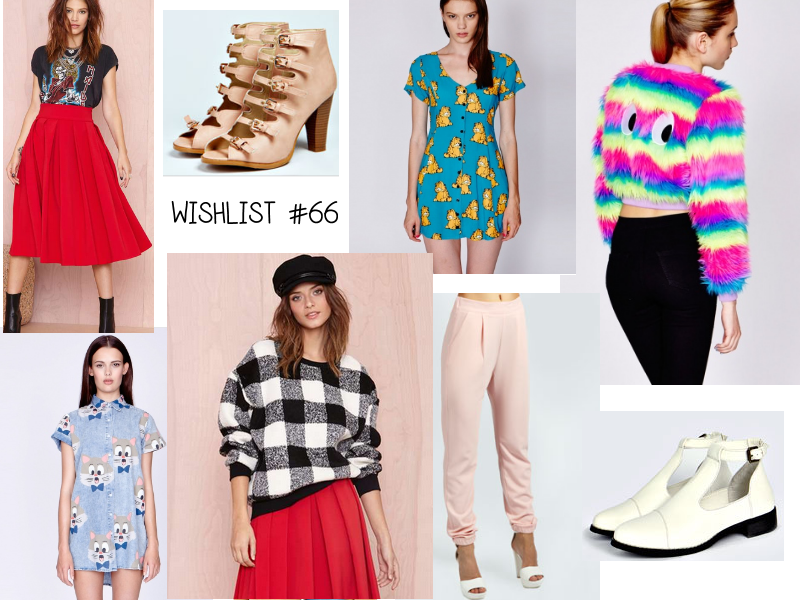 I just want all the things on this wishlist in my wardrobe right now. And more than the rest, the crazy Lazy Oaf fur jacket - OMG. I would look like the most mental person walking around in that, but then again - it would suit my personality perfectly, so why not!? I'd actually get it if it wasn't for the huge price tag *insert sad face*. Y U SO EXPENSIVE LAZY OAF!? Of course, Garfield the cat on a dress is going to be on this wishlist - anything with an animal face or cartoon on it. That's why there's the kitty shirt too. I wouldn't be complete without a wardrobe filled with zoo animal prints... I'm really into smart wear at the moment and really making my outfits look like I'm making an effort everyday. I'd love to get my hands on this beautiful red midi skirt - It's the shape I'm in love with and the colour is just gorgeous. It's a twirl-worthy skirt, which makes me drawn to it a little more! White boots have been on my wishlist for well over a year - and I should actually invested in some by now. These would be cute, and with little frilly socks especially. I'm often told how mad I look with the socks and shoes combos that I do, but I just love the look, and think it's so cute and quirky! Is it old yet? Or can I carry on getting away with it?